Caroline warns Hilary to stop gossiping about her. Harold, Madge, Kerry and Joe watch a scary movie. Later, at the Bishop house, an apparition rises up in the kitchen window and Madge screams. Harold comes rushing back from the bathroom to see what's going on. 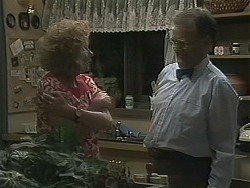 Madge explains that there was something horrible in the window, but Harold can't see anything. He starts to laugh, thinking Madge is imagining things. He is reluctant to go outside and check though(!) Madge thinks that the apparition looked like a devil. MADGE: I know I saw something! Kerry asks Joe if he meant what he said about living in the country. He says he's come round to the joys of country life - he got a taste for it when they went fruit-picking. Kerry kisses him gently. Toby and Lochie are still sneaking around. LOCHY: Should we get some more victims? TOBY: Is the Pope a Catholic? TOBY: It's a joke, get it? Paul is reading through Des's motivational course notes while Melanie and Bronwyn giggle. Melanie says maybe she should do a course to help her find a boyfriend(!) She has decided to go and see a clairvoyant though - if she's not going to find the man of her dreams she might as well go ahead and become a nun(!) 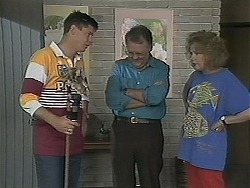 Paul rubbishes clairvoyants, but Melanie reckons that her friend had an amazing experience with one. Just then, Melanie hears a noise. She goes to the kitchen and apparition rises up in it. She screams the house down! Des and Paul run out to find out what it was. Joe and Kerry are having a pash on the sofa while loud shouting goes on outside! They can't drag themselves away, but then Kerry hears a noise in the kitchen. She makes Joe go and look. Just then, an apparition comes out - which looks like Lochy and Toby under a grey sheet holding a ram skull. They are closely followed by Des, Paul, Melanie and Bronwyn. Melanie is telling Toby and Lochy off. They apologise saying they didn't think it would be so scary - apparently Hilary freaked(!) When everyone has gone home, Joe and Kerry decide on a punishment. Joe reckons he'll call the zoo saying they have a new scheme to lock naughty children in with the animals for a night. Toby and Lochy look absolutely terrified at the thought of being put in the crocodile swamp(!) They start apologising profusely and Joe lets them off. Providing they apologise to all the neighbours too. Madge is still jumpy this morning. 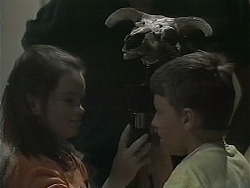 Joe comes round with the ram skull to tell her what happened last night. Gloria calls round with some news for Madge - she's resigned from the Waterhole because she can't work with the new bar manager. Madge thinks Gloria has resigned because of her(!) Madge says she might have an idea of how Gloria can find new work. 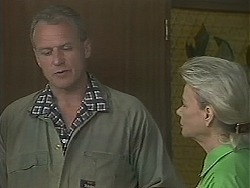 Jim is worried about Beverly - he doesn't like leaving her on her own at the moment. He'd rather that Rhys was taken away sooner rather than later if he's going to go - Beverly is getting more attached as time goes on. Des is buzzing after his latest motivational session. 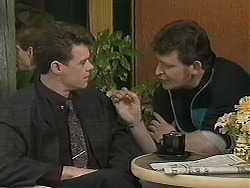 He tells Paul about "visualisation" of what you want. He tells Paul to enrol on the course as well! Harold is appalled to hear that Gloria has resigned from the Waterhole. 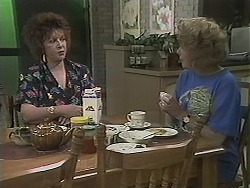 But Madge says she has the solution - Gloria can look after the Coffee Shop while Madge and Harold are overseas. 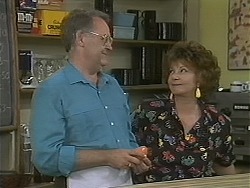 Harold isn't too keen, but Gloria is enthusiastic, so Harold is forced to agree. She immediately comes around the counter to "learn the ropes". GLORIA: I promise you, you won't regret this! Melanie has been to the clairvoyant who has told her that she has a secret admirer - but she didn't say who it was. Bronwyn is sceptical but Melanie thinks it might be one of the night porters, or one of the room service guys. Then Paul comes in and Melanie wonders if it's Paul(!) She doesn't think it'll be long before the mystery person reveals himself! 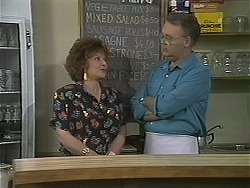 Gloria is serving a customer called "Digger" but Harold comes out and drags her into the kitchen. He asks her not to chat to the customers so much - the Coffee Shop isn't the Waterhole and the customers like the atmosphere to be slightly less "raucous". Gloria agrees to tone things down a bit. But Harold looks worried when she starts talking about adding some dishes to the menu. Gloria reckons Harold is a bit out of touch. GLORIA: Real men don't eat quiche! HAROLD: Now you've got it wrong straight off there...because I happen to eat quiche quite a bit! Gloria's look says it all! Toby and Kerry are shelling peas and talking about living in the country. Toby reckons he'd like to live in the country - there's loads to do and he could have a horse too. Joe comes in and collapses on the sofa. Just then, there's a bicycle bell ringing outside and it's Lochy - she's put the ram's head skull on the front of her bike!